Welcome to Real-life Sci-fi worlds. We are using science to explore life-bearing worlds that are the settings for science fiction stories. Up today: an Earth-like planet orbiting a brown dwarf. 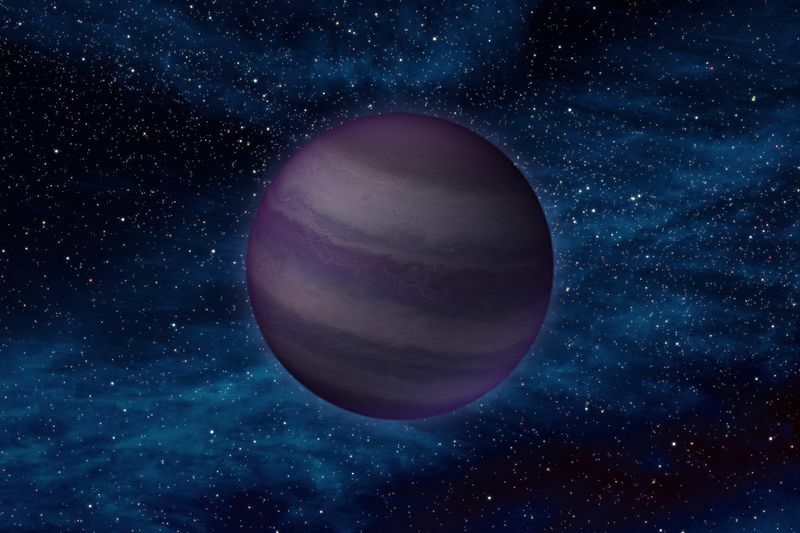 Brown dwarfs are wannabe-stars. They are just too small. They can’t generate the huge internal pressure needed to trigger hydrogen fusion in their cores. So brown dwarfs don’t generate their own internal energy (they do fuse deuterium, but not for very long and that is a pretty wimpy energy source anyway). With no internal energy source, brown dwarfs spend their time cooling off. But it takes a while. Billions of years. Brown dwarfs are between about 10 and 80 times more massive than Jupiter. But they are about the same size as Jupiter! Compared with Jupiter, brown dwarfs are just more “squished” under their own gravity. They are much denser than Jupiter but not much bigger. 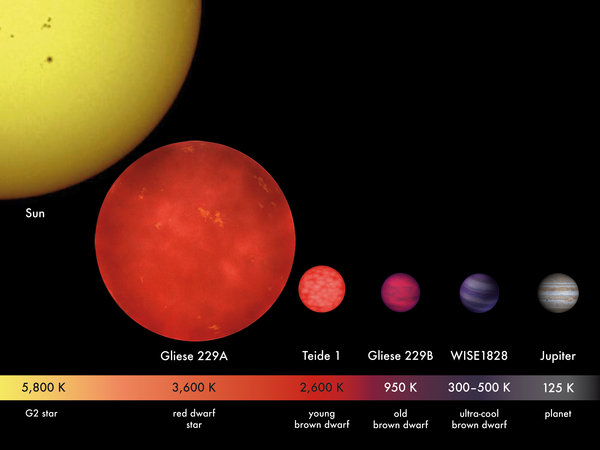 Relative sizes of brown dwarfs compared with the Sun, a red dwarf star, and Jupiter. Credit: MPIA/V. Joergens. Is there any chance for life around a brown dwarf? We are confident that planets form around brown dwarfs. Young brown dwarfs show all the telltale signs of forming planets. A couple of planets have been discovered around brown dwarfs, but those planets are too big and too cold for life. Still, it’s encouraging. 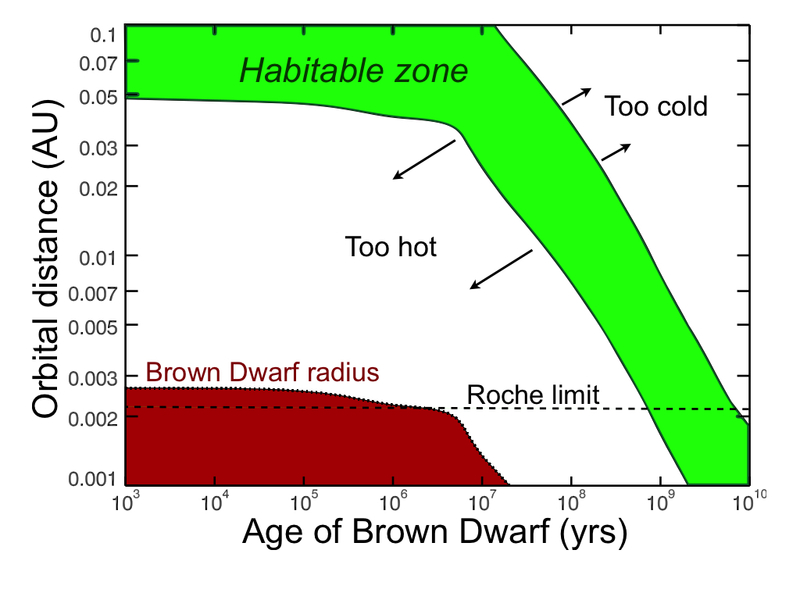 Brown dwarfs are cooler than the Sun so their habitable zones are located much closer-in. Typically at just a few percent of the Earth-Sun distance (which is defined as 1 “Astronomical Unit” or AU). How the brown dwarf habitable zone changes in time. The green shaded area bounds the habitable zone. At small orbital distances it is too hot and farther out is too cold. The brown dwarf itself shrinks as it evolves — its size is shown in red. Any planet that comes closer than the Roche limit is torn apart. This example is for a brown dwarf 4% as massive as the Sun. Adapted from this paper by Emeline Bolmont and collaborators (including me!). A planet on a fixed orbit cools off along with the brown dwarf. This corresponds to a horizontal line in the image above. A planet with an orbital distance of, say, 0.01 AU starts off too hot. The habitable zone sweeps inward and after about 100 million years it catches up to the planet. The planet remains in the habitable zone for almost a billion years until it exits past the cold edge. The frozen planet then cools off indefinitely along with the brown dwarf. What would it be like to live on an Earth-like planet around a brown dwarf? Let’s assume the planet is located in the habitable zone when the system is a billion years old. For the example from above, that would put the orbital distance at about 0.005 AU. If Earth’s orbit was the same size, that would put us on the surface of the Sun! It is a ridiculously small orbit. Earth’s sky is blue because the atmosphere scatters blue light more strongly than red light (this is called Rayleigh scattering). A brown dwarf emits no blue light. It barely emits any visible light at all! Its energy is mainly radiated at infrared wavelengths of light. There is pretty much no scattering of the light from a brown dwarf. This means that, to our eyes, the atmosphere would be basically transparent. The brown dwarf would appear reddish-brown (and gigantic) in the sky. But look just to the side and you can see the stars! It would basically look like nighttime except in the direction of the brown dwarf! Clouds would simply be black patches blocking the stars. Author’s impression of a brown dwarf 55 times more massive than Jupiter. This is basically how the sky would look from a planet orbiting a brown dwarf. Credit: NASA/JPL-Caltech. Of course, this assumes that inhabitants of these had eyes like ours. More likely, their eyes would be sensitive in the infrared. Earth’s atmosphere is almost completely opaque in the infrared except for a few transparent “windows“. I can imagine these aliens’ eyes being sensitive at several different infrared wavelengths, to gather different types of information. Maybe these wavelengths would appear as different “colors”. OK, I’ll stop speculating (for now). The surface of a habitable planet orbiting a brown dwarf is always illuminated the same. So the climate would probably be very consistent. This is not quite as simple as it seems — the planet is also spinning! To always keep the same face pointed toward the star the planet needs to spin once per orbit. And a planet in the habitable zone orbits its brown dwarf host in as little as 8 hours! On average it takes more like a day. So even though the planet is always facing its star, it spins at about the same rate as Earth! No one has modeled the climate of this kind of planet so we don’t know exactly what it would be like. The entire globe could be habitable. With an atmosphere like Earth’s it would probably be cold on the night side and warm on the day side. But if the planet’s atmosphere were thicker than Earth’s, then the temperature would be relatively constant everywhere. Likewise, if the planet’s atmosphere is very thin then the difference in temperature between the day- and night sides would be much larger. There is an interesting strategy in searching for habitable planets orbiting brown dwarfs. It is based on the transit method. It works like this. It’s hard to find Earth by the transit method: the dip in brightness is very small, it only repeats itself once a year, and the odds of Earth’s orbit being lined up right are small (about 1 in 200). It might be easier to find planets in the habitable zone of brown dwarfs than a planet like Earth orbiting a star like the Sun. Brown dwarfs are smaller than stars so a transiting planet creates a much deeper dip in a brown dwarf’s brightness. The transit repeats itself every day instead of every year. And the chances of the planet’s orbit lining up right are about 20 times higher! The only problem is that, since brown dwarfs are faint, it is hard to measure their brightness accurately. Still, this is a promising way to find planets around brown dwarfs (see this paper for the gory details). Some ballpark numbers. Within 30 light years of the Sun there are more than 400 known stars (details here). The vast majority are low-mass (M) stars, also called red dwarfs. 20 are Sun-like (G) stars. At least 48 are brown dwarfs. I say “at least” because more are being discovered all the time. 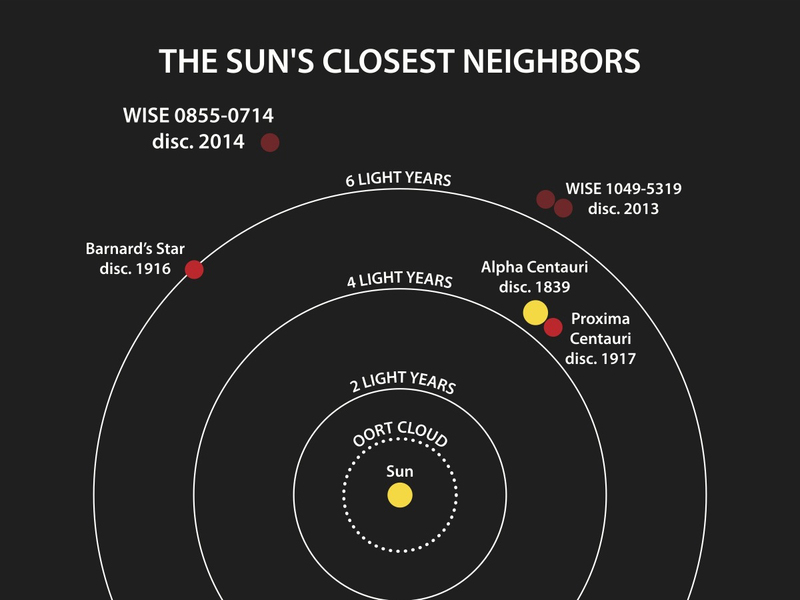 Our Sun’s closest neighbors. Three brown dwarfs (including two in orbit around each other) have only just been discovered (with WISE). Credit: Penn State University. What fraction of brown dwarfs have a potentially habitable planet? We don’t know. About half of all red dwarf stars have a planet in the habitable zone. This fraction is at least 5-10% for Sun-like stars. Let’s be pessimistic and assume the frequency for brown dwarfs is even lower, just 1%. There should still be an Earth in the habitable zone of a brown dwarf within 40 light years of the Sun. Not too shabby! A group of scientists is discussing the chances for life on other planets. Except, these scientists are not on Earth. They are on an Earth-like orbiting in a brown dwarf’s habitable zone. They sit on old wooden chairs in a dusty room tiled with bookshelves. Out the window is a starry sky and the giant, looming brown dwarf. The scientists agree: life is unlikely to exist on planets orbiting stars. Especially bright stars like the Sun. The habitable zone is so far away that such planets would only feel very weak tides. These planets could spin any which way! The illumination on their surfaces would be changing constantly as the planets spun! The climate could never be stable on such planets! Not to mention the variations in illumination over the course of the year caused by the planet’s tilted spin axis (obliquity). Without tides the planets’ orbits could even be eccentric! No planet could be habitable with even a modestly-eccentric orbit! Of course, how could a planet ever develop life in the first place without a hot early phase? The millions of years before the habitable zone swept inward to include the planet — during which the planet was too close to the brown dwarf — must be responsible for the complex chemistry of life. Without a hot phase, planets in the habitable zones of stars could never have complex life! The story ends with a spaceship from an advanced alien civilization — that originated on a planet orbiting a star — approaching the system with evil intentions. Bad news for narrow-minded thinking! There you have it: Earth around a brown dwarf. A Real-life Sci-Fi world. Special thanks to Franck Selsis and Philip von Paris for some of the ideas in this post. Actually, a planet around 0.003 AU from the brown dwarf has a healthy time in the habitable zone. It enters the habitable zone when the star is only about 900 million years old (and the planet itself should just have cooled by then) and then it stays in that zone for at least 6 billion years! That is a similar amount of time to Earth, which has been around for 4.5 billion years and only has about 1.75 billion years left at most. Those numbers alowes for the “rare homeworld” story suggested by the blogger, since it would remain habitable long enough for macroscopic life to evolve. Sensibly, a day/night cycle increases the habitable part of a planet. On a tidally locked planet the climate belts are more or less concentric on the day side. But on a planet or moon with a reasonable day/night cycle they instead smear out along rough lines of latitude, making most or all of it habitable. Similarly, I think that moderate seasons actually increase a planet’s or moon’s biological productivity. When I say “moderate” I mean that the planet or moon don’t freeze over, neither does any part of it get boiling hot at any part of the year. It does not matter if the seasons are due to axial tilt or varying distance to its sun. Changes in temperature and/or precipitation will still increase biological productivity in many areas. I am not sure to what extent ocean currents are affected by the seasons. But without seasons the Earth would have had larger ice caps, more desert and less forest than in real life.